5 surefire ways of leveraging the power of online reviews! The fact of the matter is that the internet is overflowing with online reviews. Whether you like it or not, chances are high that your customers will go online to leave feedback about your business. What’s more, chances are equally high that those that wish to do business with you will first consult online reviews before walking into your business. From Google to Yelp, Shopper Approved, TripAdvisor and Facebook, there is no end to the platforms that your customers can use to review your business. To those that are just beginning, online reviews may appear rather intimidating. You may think that there is no way of controlling them and that your business will end up being buried in a sea of negative feedback. You may even dismiss reviews offhand as something that’s not very important. However, doing this tends to be rather perilous. Just consider the fact that up to 90% of consumers first consult reviews before making purchases and you will understand why your business cannot do without reviews. So, how do you leverage the power of online reviews to grow your business? The great thing about online reviews is that they offer free publicity. Okay, the publicity may not be that free, considering that you actually have to provide a great service to get people to leave positive feedback, but online reviews are a cheaper way through which you can increase your business’ online visibility. Your business gets greater visibility, in that your customers can easily find you. Reviews help your customers make informed decisions. This, in turn, translates into greater customer satisfaction. Signing up with Shopper Approved means that the business that are collected about your business are syndicated to the widest range of Search Engines. This includes to such platforms as Google, Yahoo, Bing, Citysearch, Youtube, Twitter and Facebook. Reviews are, in this sense, a great way through which you can increase your business’ Search Engine visibility. Reviews constitute part of the data that is used by Google when assigning star ratings to PLAs and to Ads. The thing to remember is that it’s not enough to simply collect a few reviews for your business. What you should aim to do, instead, is to collect the right kind of reviews. Shopper Approved helps you collect local, merchant and product reviews as well as video Testimonials. A lot of the review collection platforms that are out there are at least partially free. These include Google, Yelp and TripAdvisor. What it means is that you can go to any of these platforms, and to many others, to claim your listing. Once you have done this, you can then begin sharing links to your pages with your customers to get them to begin leaving online reviews about your products and services. Claiming your listing on Yelp or any other free platforms is something that every business should be doing, as we have already noted. However, if you are looking to get the most out of reviews, you need to go over and above the free listings. One of the best companies that offer review syndication services is Shopper Approved. 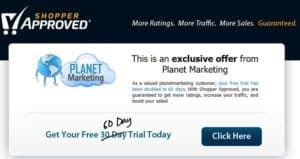 You can, as we have already stated, sign up with Shopper Approved for a 60 day free trial using the Planet Marketing link. That’s twice the number of days that you would expect to get should you sign up with Shopper Approved the normal way. So, what is it that makes it necessary for you, as a serious business owner, to sign up for Shopper Approved or any of the other paid listings? The reviews are then syndicated to all of the major search engines that can be found out there, including Google, YouTube, Yahoo, Bing, Citysearch, Twitter and Facebook. You get all the tools that you need to gather feedback from your business’ customers both on an offline. Shopper Approved is one of the cheapest companies of its kind that you will be able to find out there. Not only that, but you can also get a further discount by signing up using our link! Let’s assume, as an example, that yours is a restaurant that operates in a neighborhood somewhere in California. This type of business is heavily reliant on online reviews and on word-of-mouth. That is because your customers are only ever going to come from a limited radius around your premises. So, how do you get people to review your restaurant? You could, of course, allow reviews to flow to your business the organic way. However, one of the things that you will realize is that people are not naturally inclined towards leaving reviews on the internet. You actually need to push them to get them to do so. In order to fully leverage the power of online reviews, you need to ask your customers to give you feedback. Note that some platforms, such as Yelp, frown upon the practice. However, most, including Google, actively encourage people to solicit for reviews. As already noted, people are not naturally inclined towards leaving feedback about your brand. In order to get them to do so, you need to make the entire process as simple and easy to understand as is possible. Other than just reading them, online reviews provide your business with the chance to make improvements on your customer experience. If many people have been raising the same issue about your business, it means there is something wrong somewhere. Use the feedback that you get online to improve yourself. In this regard, reviews are a good way through which you can listen to your customers’ concerns. In other words, Shopper Approved simplifies the entire process of gathering feedback from your customers. So, what are you waiting for? Try out Shopper Approved now to start taking advantage of the power of online reviews.